The Reach Blair Inez Scianna Learning Activity Center was opened in January 2005. 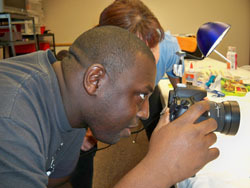 The philosophy of the center is based on helping every individual achieve their personal goals. 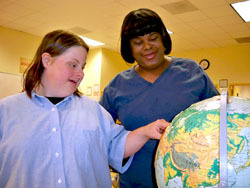 We serve individuals with a primary diagnosis of intellectual and developmental disabilities. The Learning Activity Center belongs to the people being served versus the people serving. Every moment is precious – maximizing learning is a priority. Everyone can learn – meaningful participation that meets individual learning styles is everyone’s right. Self determination and choice will steer client participation. All stakeholders strive for excellence and continuous improvement. Our philosophy drives a comprehensive curriculum that helps each individual develop skills that will help them be more independent and social while participating in programs that enrich their lives and their community. For more information on registration and tuition please call 281-213-8132.